P.S. 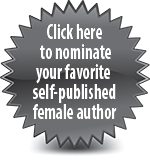 – Nominations end May 31st! ← Forget the Chocolates… Eat Dates! Seriously. Wonderful honor, Sanjean! I tried nominating you, and the system keeps telling me that the e-mail formats I’m using aren’t correct. I tried a few times, and it’s not letting me submit. I have the e-mail addresses correct, and I made sure everything was lowercase. Hmm, I will check with the administrators! Thanks for letting me know and for trying!